Do you wonder, what is Kombucha Tea and how is it good for us? First of all, I'm well aware that most of you have NO idea what Kombucha Tea is, how to pronounce it, how to make it, or why in the world you would want to. I'll cover all that and trust me, you want to know this. But also, for those of you who may have been making it for years, I found out recently that there are MANY “bad” (or incomplete) recipes getting passed around. They can result in either something that is actually toxic, or at the least, something that has no benefit to your body at all. Today inPART 1: What is Kombucha Tea and how is it good for us? PART 2: 15 tips for making it correctly. IMPORTANT NOTE: I recommend only buying scobies (your kombucha ‘starter') from this company I know and trust – who also have GREAT customer service, by the way. How do you pronounce it? It is pronounced, “Com-boo-chuh”. What is it? It is a fermented, traditional Middle Eastern beverage (it has been around for several thousand years) that is easy and inexpensive to make, and is VERY beneficial to our bodies. Each time you make it, another starter mushroom forms that you can use or give away to a friend. It takes 7-10 days to ferment, and then you can drink as much or as little each day as you'd like. Sometimes the Kombucha mushroom is called by its nickname: “Scoby”. Who made you the expert? I'm no expert, believe me! And as a matter of fact, the first time I tried it a couple years ago at a local Weston A. Price chapter meeting, I thought it tasted only “OK”, so I hadn't tried making it myself until recently when Julie got me interested again. I love it now (and thankfully so does the rest of the family! ), but I've only made three batches so far, nowhere even CLOSE to being an expert! However, because of the way my mind won't shut off until I find the real truth on whatever the issue is, I've recently talked at length with the person who IS an expert: my friend Hannah from Kombucha Kamp! After finding out from her that I did my first batch all wrong (more on that next time), she sent me a new Kombucha “mushroom” so I could start over. (They're commonly called that, but not really mushrooms at all.) With each new Kombucha culture/starter mushroom you also receive lots of information on making it. What does it taste like? The best way I can describe it, is that it is a refreshing cross between apple cider and tea. Our batch before last was a bit stronger and tasted more like a slightly fermented cider (so I added a little filtered water to mine, but Kent& the kids liked it straight); then our latest batch was very sweet and extra delicious, it tasted more like apple juice with a little fizz. Next time in part 2 I'll explain more about how it is normal for the taste to vary. Our kids love it and we call it, “Kombucha Pop”, so of course they gulp it down. Many of the benefits listed here are common to all traditionally fermented foods, due to the healthy bacteria that are produced in this process, but others are unique to the Kombucha. Now when someone asks you what is Kombucha Tea and how is it good for us, you'll be able to answer them! Next time in part 2, I'll let you know about the ways I messed up my first batch of Kombucha, and how to make sure you're making it correctly. Check out this newer post: Compare Kombucha tea to Kefir Soda Pop. Check out this simple and affordable meal planning program! Need some main dish ideas? I’ve been making it for about 6 months now. I have been using quart jars and RO water from walmart. Is this bad? It tastes great and has been seeming fine. I purchased kombucha from a farm and I was wondering how long it lasts and if it should be heated before drinking. Have I mentioned how great this site is?! No, don’t heat it, eat it cold so it’s refreshing! It will last a long time, but after a while may get a more vinegary taste. Tee hee, Kel, when I did a web search for “how to prounounce kombucha”, this is where I ended up. I shoulda known. :>) I am especially interested to read that the caffeine is mostly gone at the end of fermentation. I gave up the stuff over 10 years ago when I figured out that it made the cysts in my upper mama parts really swell and hurt. (TMI?) I made some chamomile tea to ferment before leaving for my folks’ but I’ll try some standard stuff for the next ferment. Hubs has beer brewing supplies, so I might try to talk him into bottling for me if things work out. Thank goodness for the web’s huge pit of information! I’m sorry but I’m making kefir soda these days and not kombucha lately, so I don’t have any babies to share. Maybe someone else will…? I am so pleased and thankful to read through this discussion. I’ve just returned to GR, MI and am in deep desire to start raising kombucha. I’ve done so for a number of years before, but I do not have access to a scoby just yet. If anyone has some ready and is willing to trade or barter, I would love to talk. Kelly, I’ve been using non-organic table sugar for my laurel farms kombucha tea. Does Betsy insist that the sugar is organic?? I just read through the posts… it reminds me how concerned I was, when I started making kombucha about 5 years ago, with keeping the temperature warm enough. I actually did use heating pads at first. Now I know not to bother. Aside from the electromagnetic radiation angle, it simply isn’t necessary. The kombucha mother loves it in my cool kitchen, which is open to the outside most of the time, and the temperature here is usually 50s and 60s (it’s Aug. 1 and cool, overcast). Warm days get to 70s outside. The kombucha develops just fine. It may take a little longer, but only about 10 days. I’m extremely sensitive to caffeine, so much so that a cup of coffee would give me a raging migraine that could easily last 2 days if not drugged. But the kombucha doesn’t bother me so I’m sure the caffeine has been metabolized by the SCOBY. The same with the sugar. For the lady who doesn’t like the looks of the mother, just don’t look at it! Cover your jar or bowl with a kitchen towel. I never “fish” mine out except to remove old ones. I just remove the finished liquid with a measuring cup or a turkey baster (which is good for filling small glasses, such as re-used KT’s/Sunergy jars) and leave the mother undisturbed. Incidentally Ikea has a gallon-sized jar that is perfect for kombucha. It’s very wide so you get lots of surface area. I love kombucha, and I think it helps me with digestion and yeast issues, but there is a lot of nonsense out there about it. If it really did turn gray hair back to colored, I’d know by now. It doesn’t. OK, I just can’t get into this. I’m going to share my childish feelings about it, perhaps just to make you seasoned pros laugh. I have no problems “growing” things– I like to garden, I have even grown my own mushrooms, I make my own yogurt, kefir, sourdough bread and I’m working on fermenting things, I have even made my own vinegars. But the kombucha mother freaks me out. 🙂 It’s seems weird and gross to me. I can’t imagine seeing that thing floating in a jar on my kitchen counter, like a mad scientist’s experiment gone wrong. And fishing it out and saving it???? EWWWWWW! I tried store bought kombucha tea and I hated it. It tasted, to me, like something gone bad, and I couldn’t stand the “pulp”. Couldn’t bring myself to down even half of the bottle– and I’m not a particularly squeamish person. I was really surprised that I didn’t like it– because I do like alcoholic beverages, I like apple cider, I like tea, I even like soured, cultured, fermented stuff. There is a video on youtube entitled “How to make your own Kombucha mother” from a bottle of storebought Kombucha. Fairly simple, really. well if there is anyone intersted in obtaining a scoby and you live in west michigan, i have them and they need new homes. Everything I’ve read says that most of the caffeine is gone by the time the Kombucha is done fermenting. I haven’t had any problems when my kids drink it. What about the caffeine in the tea? Is it significant enough to worry about giving children kombucha to drink? Sorry, you lost me on that Stargate stuff, but I’m sure many readers know exactly what you’re talking about – I’m just THAT out of the loop with things! In Friday’s post I talk about which brands Betsy recommends, but here’s what she says about those vs. homemade – they’re fine for a quick drink now and then, but if you’re drinking Kombucha for physical reasons, you should really drink the original that you make yourself. “SCOBY” = symbiotic culture of bacteria and yeast….. okay – when I read that, all I could think about was STARGATE (the kids and I have been having stargate marathons the last couple weeks…) – you know, T’ealc’s “symbiote”???? The whole house is kept about the same, with some rooms even cooler than the main rooms. Will probably need to get more creative with how to keep certain areas warmer. Does a hot pad work? Actually I answered you wrong before. My husband keeps the house heat just under 70*, but the room I make the Kombucha in has a wall heater that I adjust to be warmer. Do you have a room that is always warmer in the winter? I’m publishing part 2 on Friday and it talks about whether or not you should flavor your Kombucha with ginger or other additives…I asked Betsy that specific question, so be sure to check back! Thanks for the reminder about Kombucha! 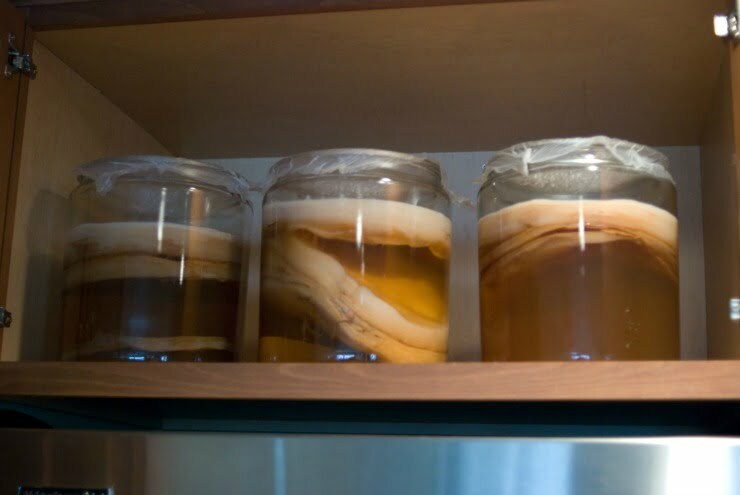 I have some SCOBYs “on hold” in my fridge from a while back. I need to get them going again. In case anyone is interested, SCOBY is an acronym for Symbiotic Culture of Bacteria and Yeast. Even though kombucha is made with sugar, I find it is all or nearly all gone by the time it is finished, so I can drink a bit without having it mess with my blood sugar. It’s a bit tart, like diluted apple cider. I have Betsy Pryor’s book, as well as one written by a German. Plus, Sando Katz’s book Wild Fermentations has some kombucha info. One thing I haven’t found out how to do is make flavored kombucha, such as ginger. I can find local bottled ginderade flavored kombucha in the store but I haven’t figured out how to make it myself. I did get a tip from someone that the ginger (or other flavor) is added during a second fermentation, not during the initial one. So the way I interpret that is to make kombucha, then ferment it again with the ginger. I’m assuming that is without the SCOBY, and perhaps with a bit of sugar added to give some fuel to the ferment. But I haven’t tried it yet. Any tips on this are appreciated. We keep our house comfortable during the day (still not above 70) and on the cool side at night. I actually live in Michigan, but since our heat has still been on at night, it stays above 70* in here easily. As it gets closer to summer, we won’t need to worry at all about keeping the temp up! Thank you for this interesting post. I have tried Kombucha and would like to try my hand at making it. My main concern is maintaining the proper temp (I live in NH). But, if you, living in Wisconsin can successfully make this, then there is hope for me. I will stay tuned for more posts on the continuing saga of Kombucha tea!